Elements of the whole range of Kawneer’s architectural aluminium systems feature on the most central and prestigious new development in Cambridge for years. Kawneer’s AA®100 curtain walling, which is structurally silicone glazed and mullion drained, was specified by Glenn Howells Architects for Parkside Place, along with AA®3110 horizontal sliding windows, and AA®603 light-duty tilt slide doors, AA®605 low/medium-duty swing doors and series 350 severe-duty commercial entrance doors. 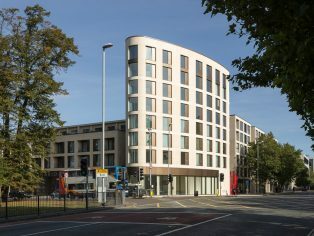 The £17.5million mixed-use development comprises four blocks of luxury apartments, one of which is eight storeys and curved on plan to soften the corner of a major intersection overlooking the 24-acre open grassland of Parker’s Piece – one of the city’s major parks. Some of the 99 mixed-tenure apartments were built over the replacement Parkside Fire Station, located amidst the city’s central colleges, just a stone’s throw from the main shopping and entertainment areas, Grand Arcade and Grafton Shopping Centre.